Happy 4th of July everyone! Now in the spirit of my feelings toward America these days, I will proceed to not talk about America, but instead talk about a film that is incredibly Japanese. It’s an odd coincidence that I saw the upcoming A Ghost Story at the Seattle International Film Festival the same week I watched Tokyo Story for the first time. Not so much because the films are super similar to each other (though the looming specter of death does play a big part in both of them), but more because they both furthered my appreciation of the 4:3 aspect ratio. Now, I feel like for cinephiles like myself that came of age during the wonky transitional period from VHS to DVD (and also the ubiquity of widescreen across all mediums), 4:3 has a bit of a stigma attached to it. But as A Ghost Story (as well as The Grand Budapest Hotel a couple years ago) shows, there is certainly some merit to what is known as the “Academy ratio”. After all, you have to remember that the first 50 years of film (and a lot of the films we’ll be talking about this month) were shot in this format, and I don’t think it makes them any worst for it. 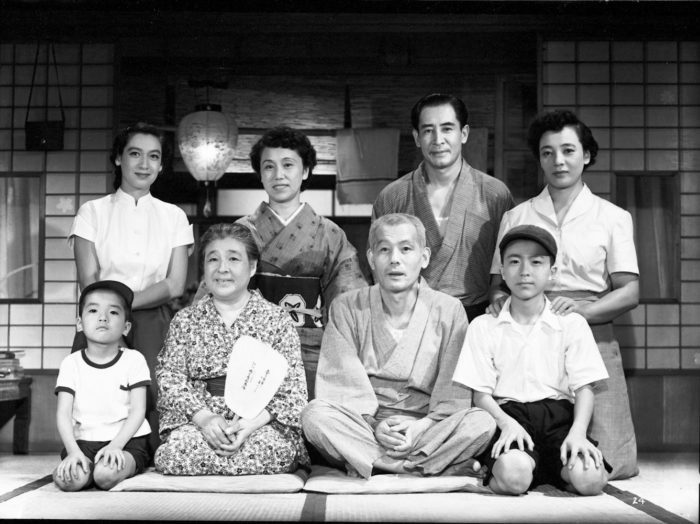 In fact, it’s hard to imagine a film like Tokyo Story shot any other way, since there’s nothing overtly cinematic about this film, and thus feels like the characters are always placed in these very box-like compositions, that are at once intimate and constraining. But before I get to talking about what is so intimate and constraining about Yasujiro Ozu’s visual style here, I should probably discuss the world these characters inhabit. It’s post-war Japan, and retired family patriarchs Shūkichi and Tomi Hirayama (played by Chishū Ryū and Chieko Higashiyama respectively), decide to go on an extended trip to Tokyo to visit their adult children (and grandchildren). 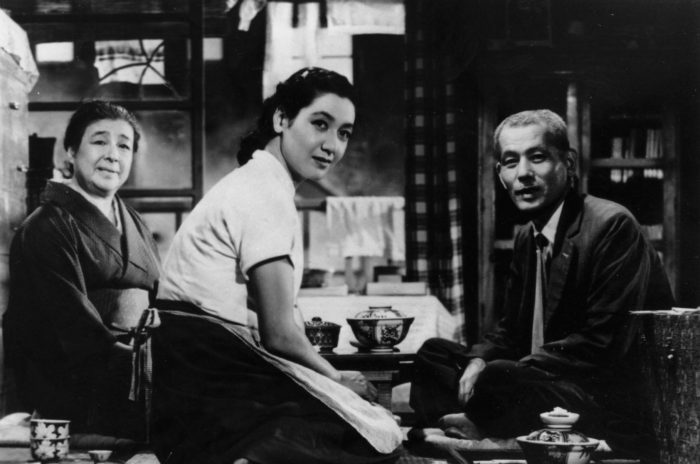 They quickly find that none of their family has much time for them, while the one to form the most intimate bond with them is Noriko (Setsuko Hara), the young widow of Shukichi and Tomi’s deceased son. Otherwise, there isn’t much to discuss plotwise when it comes to Tokyo Story. We’re treated to almost a series of vignettes of our elderly couple trying to connect with their children or old friends, and having trouble finding that connection. 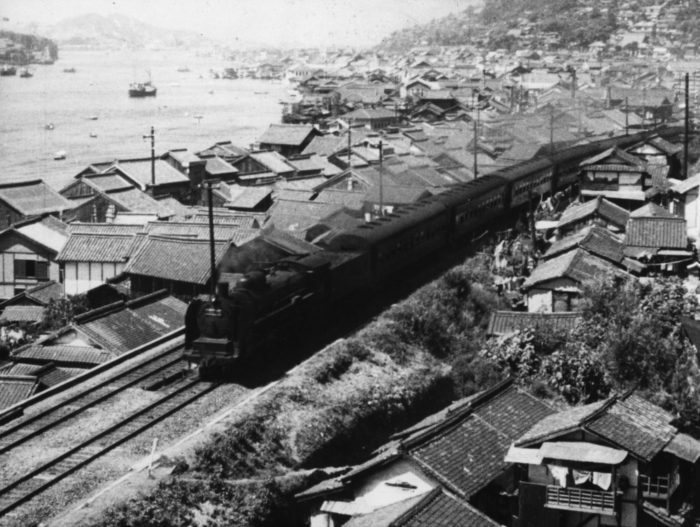 As I probably should’ve mentioned earlier, this is the first film of Yasujiro Ozu’s that I’ve seen, and it seems like one of the main themes of his work is this difference between generations that existed in Japan in the 20th century, as the country found itself marching headlong towards modernization. So it’s no coincidence that the film’s most striking images are its shots of smokestacks and giant brick buildings set against the more serene countryside. The rest of Tokyo Story is marked by a more straightforward visual approach, which in its own weird way is quite visually striking. Ozu was known for what is known as the “tatami shot”, in which the camera is placed at a low, 90-degree angle, so as to look like we the audience are sitting on a tatami mat while watching these characters engaged in polite (but also kind of quietly tragic) conversation. There’s also another type of shot Ozu employs a lot in the film, in which characters will be having conversations with each other, but they’ll be looking straight into the camera. Which again, isn’t a brilliantly unique choice artistically, but adds to the film’s subtle way of letting you feel like you’re right there, engaged in these conversations that weren’t meant for outsiders to listen in on. Because that’s what much of the film’s dialogue consists of – the kinds of private conversations about life, death, marriage, children, regrets and the other monumental subjects that we think about constantly, but only discuss with family or close friends. Which I think is why Tokyo Story has become such a revered film by many directors (in 2012, the Sight & Sound poll, which is voted on by the world’s most renowned film directors, voted it the greatest film of all time). It’s a film that seems to tackle life’s big questions, but does it in a way that’s just so unbelievably simple. The bulk of the film takes place over the course of a week or two, features just has a handful of characters, while none of the camerawork is particularly virtuosic, and yet… there’s just something about it. That something certainly has to do with the way it juxtaposes the young against the old, which is heartbreaking in a way you can’t really quantify. I’m currently reading Jennifer Egan’s A Visit From The Goon Squad, and due to the fact that it’s a novel that jumps back and forth in between time periods in different characters lives, it’s reminding me that the passage of time is in many ways the most potent narrative device. It’s the reason why Boyhood is maybe my favorite movie of the past decade, and also why I’m similarly fascinated by Michael Apted’s Up documentary series. It’s because time to me feels like the one thing we all have to reckon with at some point, since we all get old, and we all have to reckon with our former selves, whether we like it or not. And yet somehow Tokyo Story manages to reflect on that without beating you over the head with it. And to be honest, I feel like I’m struggling to describe this film without reverting to the kind of hyperbole Tokyo Story so skillfully avoids. But I suppose such a thing can’t be easily attained, and that’s what makes Tokyo Story feel like such a perfect little slice of humanity.